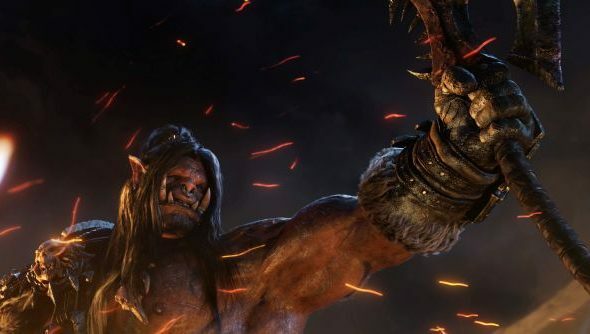 Blizzard have debuted their gritty cinematic for the upcoming World of Warcraft expansion: Warlords of Draenor. The cinematic demonstrated just how far Garrosh is willing to go to succeed in his revenge against all of Azeroth – changing the very destiny of some of Warcrafts most iconic characters. The expansion will launch on November 13th, just a few days before Blizzard’s annual Blizzcon. We’re giving away 1000 Warlords of Draenor beta keys. You should probably enter. Here’s a little rough history lesson for those who are quite new to the Warcraft franchise. In the current timeline, Grommash Hellscream – the red orc in the picture above – strikes a deal with the orc warlock Gul’dan to drink the blood of Mannoroth – an evil demon of the Burning Legion. The blood was promised to give them strength, but instead enslaved the Horde to Mannoroth’s will. They were tricked. The events that followed were long and arduous, but ultimately led Grommash Hellscream to defeat Mannoroth, ending the enslavement. But it cost Grommash his life. Fast forward to the present day where Garrosh, son of Grommash has fled through the Dark Portal after being on trial for war crimes against Azeroth following the events of Mists of Pandaria. He seeks revenge against all that opposed him, and he starts by changing the destiny of his father: preventing the Horde from becoming slaves of the Burning Legion. The fallout from his interference is yet to be fully realised, but he’s certainly gained powerful allies in his effort to march on Azeroth and exact his retribution. One thing is for sure: this expansion is going to provide quite the nostalgic trip to those who’ve been with the franchise for a long time. Will you be purchasing the game on November 13th?